This is not the story I was going to write. It was supposed to be a story about African children, and the immense opportunities for reaching them through the education system. I had some great interviews written down, and even better photos. But those are all gone now. They disappeared down a narrow, muddy path in Nairobi’s Kibera slum, in the arms of the boys who stole our bags. My photographer friend and I were visiting a vibrant ministry center inside the slum where a large-hearted man named George offered us a tour of the outreach he had built with AIM missionary Lynette Bay. Fifteen years on, there’s a clinic and a primary school, as well as a variety of adult-education opportunities. It’s well placed in a vulnerable and needy community. There’s a lot about it I can’t quite remember however. I met the teachers but can’t recall their names. The beautiful kids and George’s gentle smile were captured in photographs we no longer have. I lost the story when I lost my notes. And the hit on the head didn’t help either. My two teammates and I hadn’t walked but fifty meters on our way out from the compound when we were attacked. It’s a blur now, and probably lasted no more than thirty seconds at the time. Was it four men or five? One of them descended on me fiercely, that much I know. “Don’t move!” he shouted as he thrust for the messenger bag slung over my left shoulder. Confused, I must have instinctively pulled back for I was immediately met with a sturdy fist to the left side of my head. I felt my bag being ripped away as I stumbled from the blow. Ears ringing and adrenaline pulsing, the next time I looked up I saw a gun. Another man, probably the leader, stood only a few steps in front of me, shouting in Sheng (a slang version of Swahili). He waved the weapon indiscriminately at all of us, then pointed it skyward and fired. I cannot describe our assailants. I remember almost nothing about them—their dress, their features—except that they were young. But I remember the gun, an old, scuffed, semi-automatic. I could smell the powder and hear the shrieks from women shopkeepers after the “pop”. I could hear the scurrying feet of people fortunate enough not to be standing in the sights of the shooter. Seizing our bags, the gang then emptied our pockets in a flurry of commotion until they were satisfied they had what they came for. Then with heavy and hurried footsteps they fled, in the opposite direction from where they attacked, down one muddy footpath to another, and vanished into the maze that is Kibera. Unofficially, Kibera is the largest urban slum in Africa, but no one really knows how many people live there. Estimates vary widely, from 150,000 to 1.5 million. Probably the best guess is a “density” survey made from ariel photographs which put the number at a still-astonishing 800,000. Inside, it’s another world altogether, almost indescribable. The word “Kibera” is Nubian for “jungle”, and tragically, this is what it has become: A rusted, tin-roof forest of humanity. A quick reading of studies on the slum reveals an inventory of only the harshest adjectives. Home to the most vulnerable, disenchanted, disinherited, fringe of society. A place of rampant poverty, disease, and exploitation. In a recent humanitarian report, the British charity Oxfam summed up the living conditions in a word: deplorable. More than half the population are youths, and some are very disinherited indeed. Kibera and other similar shantytowns are both the destination and origin of many of Nairobi’s notorious “street kids”—children who should otherwise be in school or at home, but are instead making a life for themselves on the streets and probably sleeping there too. Neglected, abused, run off by a jealous step-father—whatever the reason, Nairobi has produced tens of thousands of street children. They run on fear, on drugs, and on the will to survive one more day. Some, a few fortunate ones, run into a second chance. Tony Were came from these same slums. He grew up as the only child of an alcoholic father and a deaf mother who struggled to provide for him. 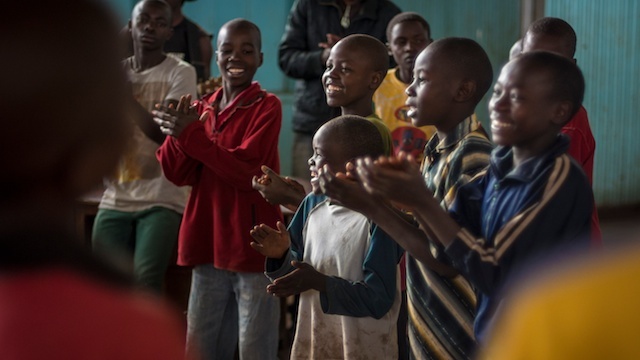 Tony was headed down the inevitable path of a wayward youth when he was introduced to the African Children’s Choir (ACC), a charity that gives underprivileged kids the rare opportunity to join singing tours and gain sponsorship for education. At age 8, Tony’s mom was invited to let him audition and he was scooped up into a series of world tours that eventually paid for his schooling all the way through university. 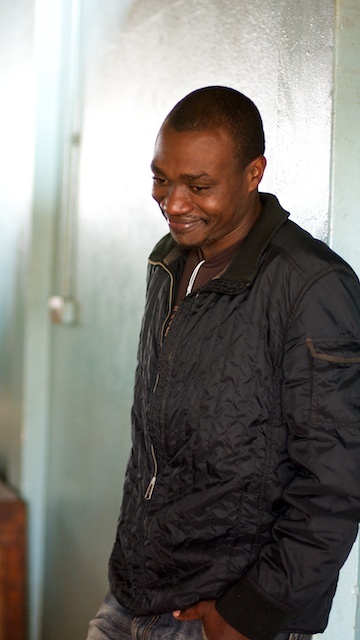 Tony became a radio broadcast journalist and landed a good job with Nation Media in Kenya. “Most of my friends that I grew up with ended up either dead, in jail, or on drugs,” he told me. So in a move most would consider foolish, he left his reporter job and went back as a chaperone and conductor for a new batch of young singers with the ACC on tour. He spent two more years on the circuit and discovered that God had given him a special rapport with struggling youth. A few years later Tony was introduced to a city-run rehabilitation center for street boys and it changed his perspective once again. After a year of volunteering at the center, Tony was determined to do more. He quit yet another job, moved back to the slum and, supported by church friends, made the street boys his full time work. The Joeseph Kangethe Boys Rehabilitation Center is but one of many throughout Nairobi, and they represent the City Council’s best effort to resolve the “street boy menace.” In night-time sweeps of dark alleys and abandoned structures, they round up boys ages seven to seventeen, and dump them at so many centers like this one. The boys are supposed to then be schooled and reformed, but typically, they return to the streets only to be rounded up again. The Center itself provides very little, and if not for Tony and the scores of volunteers he recruits—from local churches to missionary short-termers—the kids would simply languish. Instead, they are being tutored to enter back into the pubic school system, being mentored, counseled, taught guitar, and the Bible. Getting a boy from the streets to a school takes months. Many are lagging behind academically, socially maladjusted, and even addicted to drugs. It takes patience and love. But the individual attention pays off. The boys at the Center might not look much different than their street counterparts. They wear the same sort of tattered clothes and generally appear grubby and unrefined, but their eyes are different. Gone is the soulless gaze from sniffing glue. Their faces are bright and full of energy. There’s laughter, and even singing. I visit Tony at the Center on a Saturday. About thirty-five boys live here right now, and most of them gather around Tony this morning as he plays the guitar. In the spacious, echoing hall, the cracking voices of twenty adolescent boys belt out the words to one praise song after another. The boys participate willingly on Saturdays for what amounts to a children’s church service. A small team from a local Kenyan congregation has come to teach another lesson in a “storying” series through the Bible, using skit and song and memory verse. They stop to pray. All of the kids bow their heads except one of the smallest boys. I watch as he peeks around curiously at the others. He clearly has no idea how to pray. I ask Tony about him and he tells me he’s new, that he’s only been there a few weeks. Tony tells me that the younger boys have a better chance. After they reach about fifteen, they come to the Center very hardened, with a gang mentality, and tend to corrupt the younger boys. Even the young ones can come hardened if they’ve been on the streets awhile, but they are much easier to turn around. This reminded me of Jesus’ admonition that we must “become like children” if we wish to enter the Kingdom of God. There’s something inherent in a child that can more easily exercise faith and put aside the willful self. It’s so inherent in fact that there’s striking statistics to back it up. Research shows that children between the ages of five and thirteen are almost six times more likely to accept Christ compared to any other time in their life. Worldwide, 80% of those who come to Christ do so between the ages of four and fourteen. This demographic is known as the “4-14 Window”, and it highlights a critical window of opportunity to reach people with the Gospel. In Africa, the window is open even wider. Today, 43% of Africans are under the age of fifteen. And in the next 35 years, the fastest urbanizing continent on earth will also host the fastest population growth in the world. According to the Population Reference Bureau, by 2050 Africa is poised to double in size to 2.4 billion people. There’s not much immigration in this part of the world, so that means more than a billion new children may walk this soil, and soon. Most will never be as physically destitute as a street kid from the Kibera slum. But how many will pass through their formative years in a spiritual void? Tony’s work at the rehab center here in Nairobi is a powerful reminder of not only how open and receptive children can be—even the hardest of children—but of the difference a local congregation can make when they purpose to serve the kids outside their church as well as the ones inside. Where the African church is established and strong, this will be their task in the years ahead. And speaking of powerful reminders, my aching head has left me with one as well. I didn’t have time to think about it while I stood there frozen in the grip of a street thug and his pistol, but I’ve had plenty of time to think about it since. These were young men, who not long ago were lost little boys. Sadly, they are very far from “becoming a kid again”, and getting farther every day. But it’s not too late for them. In my bag were all my notes along with my audio recorder. On it is Tony’s story of God’s redemptive grace in his life. I hope they listen to the recording. As Tony sees a bit of himself in the street boys he serves, perhaps those thugs will see a bit of themselves in Tony. I hope they listen to it. I would have gladly given them my bag just for that. God has gifted you in a unique way and your Father’s (both heavenly) are proud of you. Continue good and faithful brother and servant! I was deeply touched by this article. I lived in Kenya from 1983 to 2002, 12 of those years just on the other side of Yaya Center across Argwings Kodhek, only, what, three blocks from this slum. Visited a number of times, but remained unaccosted. A friend from that time period sent this article to me, and I am glad she did. I will read more and forward to others. Tony is no doubt very much the exception to what the other young people grow into. I am encouraged to see success, even for a few. Thank you for sharing his story.